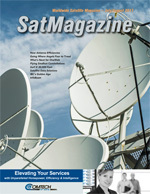 Communicating by way of satellite is robust, versatile and impactful — in recent years, satellite communications (SATCOM) has also become incredibly efficient in ways that many of us don’t consider, plus, SATCOM contributes immensely to efficiencies for terrestrial networks and many industry-specific applications. In 2015, Globalstar announced their partnership with Yippy for its search, data compression, document retrieval, and management services. In the media and entertainment industry, it can often seem as if the working year is measured by trade shows.